When remodeling a bathroom, the one major element to consider is the bath itself. You can choose to replace a bathtub with a walk-in shower or to install a walk-in tub, or traditional bathtub. Each of the options has benefits, and there are many reasons that you might consider choosing one over the other. Let’s explore the pros and cons of bathtubs and showers. For families with young kids at home, a bathtub is almost essential. While there are ways to bathe without a traditional tub, it’s much easier and more enjoyable for parents and kids alike. Children often love bath time, and a tub makes it simple to get the kids clean and give them something fun to do, too. Parents typically appreciate the option of bathing their children in a traditional tub, which is why they look for homes with full baths that have at least one installed. For folks with mobility problems, a walk-in bathtub is an ideal solution for making the bathroom more functional. Seniors can benefit greatly from a walk in tub, as it provides a safe option for bathing, as well as hydrotherapy. Hydrotherapy is an excellent way to promote circulation in the body and to aid in relaxation and stress relief. A walk-in shower can also be a suitable option for a shower seat can be installed. For aging individuals, it’s important to think about future needs, as well. Walk-in tubs are both safe and affordable. 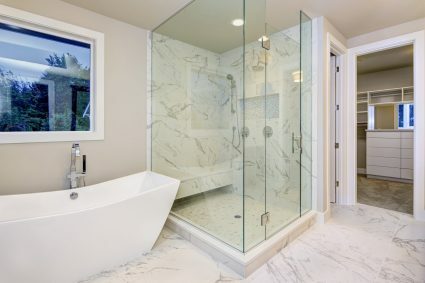 In a small bathroom, opting for just a shower stall can be a smart way to gain more space. This is especially true if you have multiple bathrooms in the home and at least one other one with a tub. In that case, it may be well worth it to install a walk-in shower and enjoy the extra space that can be gained by skipping out on a bathtub. If your budget is limited, installing a traditional bathtub and shower combination is likely the best option. It’s necessary to take other factors into consideration, including the size of the space and the other bathrooms in the home. Keep in mind that the bathroom is one of the most important spaces to potential home buyers if you are planning to sell at some point in the future. Whether you choose a shower, a traditional bathtub, or a walk-in tub, you’ll be giving an important room in the home a fresh look. When weighing the pros and the cons of each option, you have to consider the specific needs of your family, as well as your budget. You can create the bathroom that you’ve always wanted, allowing you to enjoy relaxation and personal time in comfort. Contact us today to further discuss your options and schedule a free in-home estimate.